The second of five children, Grieg was born into a successful merchant family that had the means to support his obvious talent and passion. As with many composers Grieg showed a strong interest in music and the piano at a very early age. In later years he was to reminisce: Why not begin by remembering the wonderful, mystical satisfaction of stretching one’s arms up to the piano and bringing forth – not a melody. Far from it! No, it had to be a chord. First a third, then a fifth, then a seventh. And finally, both hands helping – Oh joy! – a ninth, the dominant ninth chord. When I had discovered this my rapture knew no bounds. That was a success! Nothing since has been able to excite me so profoundly as this. Grieg wasn’t a particularly good student and his marks were bad except in… music! His classmates nicknamed him Mosak because he had answered Mozart when the teacher asked which composer had composed a work called Requiem. Most of them had never heard of Mozart and found it strange that the normally quiet Edvard could give an answer. In 1855 a visit to the family home in Bergan by the violinist Ole Bull, a distant relative, was to change Grieg’s life. Bull convinced Grieg’s parents to send him to the Leipzig Conservatory and he found himself transplant from a quiet provincial Norwegian town to one of the great centres of music in Europe. He came in contact with all the great music traditions of Europe and many of the modern composers of the day. Unfortunately he contracted pleuritis and his left-lung collapsed. The results were to plague him the rest of his life. In 1944 the big hit on Broadway was The Song of Norway an operetta by Robert Wright and George Forest adapting Grieg’s music and basing their story very, very loosely on his life. It ran for over two years in New York and had an equally successful run in London’s West End. The plot revolved around Grieg, his sweetheart Nina Hagerup, his best friend a poet Rikard Nordraak who also loves Nina, and an Italian prima donna Louisa Giovanni who has her eye on Grieg. It gave new popularity to and a wider audience for Grieg’s music. But the plot owed more to Viennese operetta traditions than to any of the events in real life. Grieg’s life was not anywhere near as romantic as the operetta but in fact Nina Hagerup was his sweetheart and did become his wife. She was also his first cousin and they had known each other since childhood however she had moved to Copenhagen when she was eight years old. When Grieg went to Copenhagen in 1860 they were reunited and the composer was charmed by her lyric soprano voice. Grieg considered her the best interpreter of his songs. They became secretly engaged in 1864. There is a suggestion that their consanguineous marriage met with some disapproval from their parents as none attended the wedding in June of 1867. Their daughter Alexandra was born on the 10th April 1868 and that same year he composed his brilliant piano concerto in A minor. It was his breakthrough on the international scene and he was finally recognized as a major composer. But the celebration of success was cut short when Alexandra died shortly after her first birthday from meningitis. 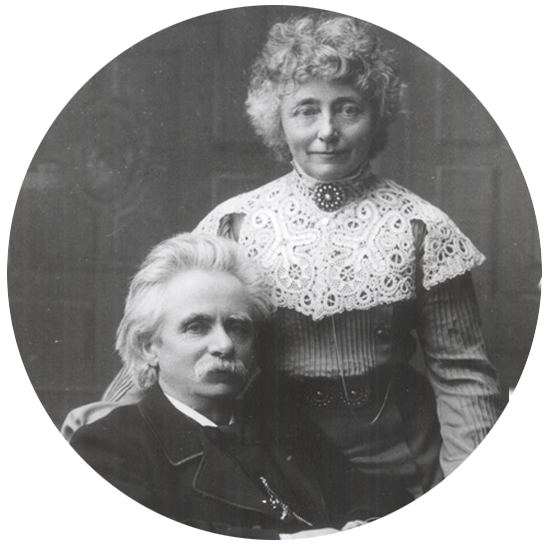 Grieg and Nina began a nomadic life travelling through Europe presenting joint concerts and he continued to compose. Though he enjoyed great success as both performer and composer he and Nina became distant and separated in 1883. Their good friend Frants Beyer facilitated reconciliation and convinced them that they needed a proper home. With Beyer’s help they bought a villa at Hop, in the outskirts of their hometown Bergen. Grieg was to call Troldhaugen his “best opus so far”. It is now a museum dedicated to Grieg and Nina. Though he was successful as a composer the main source of income was their joint concert tours. The effects of the pleuritis from his student days often made it difficult but there was always Troldhaugen to return to for the summer. But each autumn the European and North American tours would begin again. In September 1907 he and Nina planned to perform at the Leeds Festival and had moved to Bergen to await the boat that would take them to England via Oslo. Grieg became seriously ill and was hospitalised. He died on September 4, 1907 of chronic exhaustion.